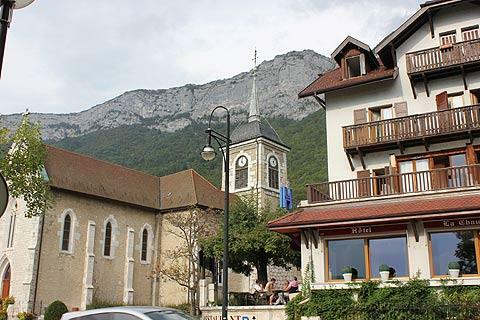 Veyrier-du-Lac is a pretty village which sits on the edge of Lake Annecy. 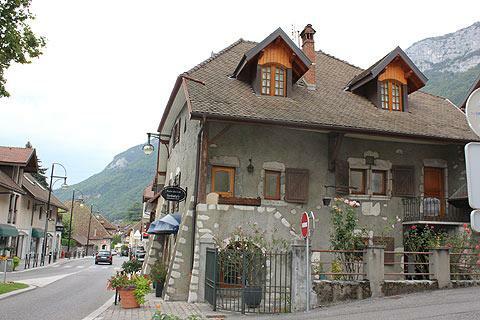 It is in a splendid position hugging the mountains on one side of the village and commanding great views of Lake Annecy on the other. 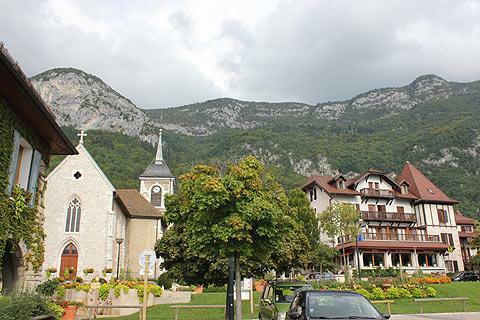 It is just five kilometres from Annecy and on the sunny side of the lake, the side known as the Rive Plein Soleil. 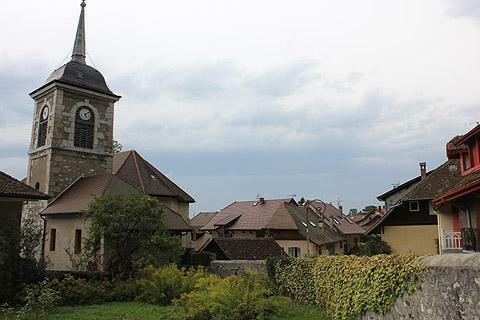 France This Way comment: it is only a small village and quick to explore, but the views of the mountains and lake ensure that you will enjoy a stroll around Veyrier and its small port as you explore Lac Léman. The town runs mostly along one main street and has attractive buildings typical to the area with steep roofs, wooden balconies and shutters. Many of them are painted in pleasant pastel colours. 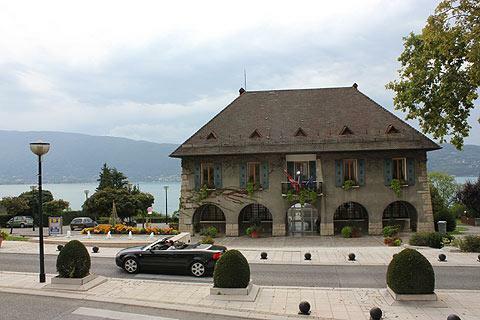 The mairie occupies the prime position in the village and beyond it are wonderful views over the lake. Opposite the mairie you can see the church of Veyrier and behind this the hills and Mount Veyrier towering over the village. Wander downhill to the Port of Veyrier which is the real highlight of the village. With its lovely wooden boat stop painted in blue/green and the beautiful Lake Annecy behind the views are superb. From here you can follow the path along the edge of the lake. A few boats are moored in the port and a few bars invite you to sit and have a drink and soak up the fabulous view. As well as catching a boat at the boat stop and visiting one of the neighbouring villages you can try sailing, diving and water skiing as well as swimming in the lake which keeps a fairly constant 24° during the summer. The most popular attraction in Veyrier-du-Lac is undoubtedly the small beach on the edge of the lake, the Plage de la Brune. The beach has a grass area suitable fo a picnic and is clean, nicely maintained and free to use although a small charge is payable for the parking (or you can walk here from the free parking in the village, a walk that takes about 10 minutes). Take a hike to the Cascades d'Angon, the Angon waterfall, where you not only have the impressive waterfalls but also great views over Lake Annecy. The Roc de Chere is another good destination, this huge rock has great views over the lake and it is in a nature reserve.